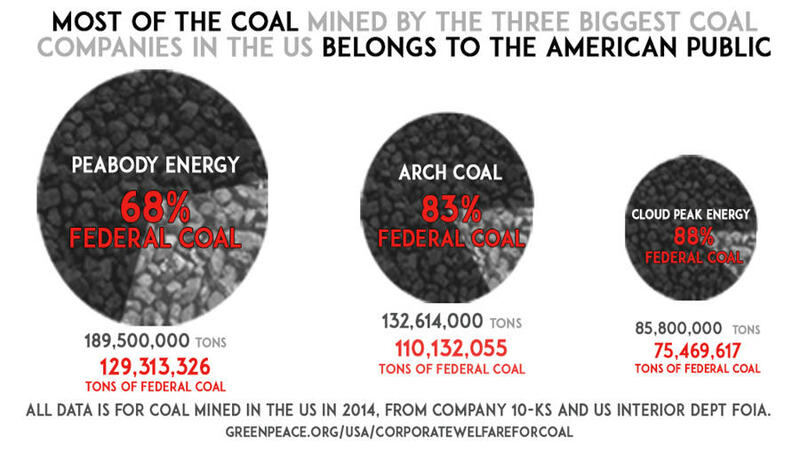 Washington DC, – A Greenpeace report published today shows that the top three coal mining companies depend on federal coal for the vast majority of coal they mine in the US. Using data obtained through a Freedom of Information Act (FOIA) request, the report calculates the amount of federal coal mined in 2014 by Peabody Energy, Arch Coal, and Cloud Peak Energy, and compares those figures to each company’s total US coal production. The results show that federal coal accounted for 68% of the total coal mined in the US by Peabody Energy, 83% for Arch Coal, and 88% for Cloud Peak Energy. “Coal companies like Peabody are biting the hand that feeds, attacking federal policies like the Clean Power Plan even while they depend on federal coal for most of the coal they mine,” said Greenpeace Energy Campaign Director Kelly Mitchell, “Secretary Jewell should build on the moratorium on new coal leasing by permanently eliminating these corporate giveaways and realigning federal coal management with US climate commitments." The report, “Corporate Welfare for Coal,” also highlights a variety of factors that have allowed the coal industry itself to dominate federal coal management decisions. For example, under the “lease by application” process, coal mining companies have been allowed to make key decisions about how much federal coal to lease and mine. Coal companies have also found ways to avoid payments to taxpayer for access to federal coal, including through royalty rate reductions. In some cases, coal leases have been sold for a fraction of one cent per ton. While coal companies have minimized their payments for publicly owned coal, this coal causes billions of dollars in damages – costs which are borne by communities, not the coal industry. Using the federal government’s mid-range social cost of carbon figures, the report calculates that the federal coal mined by the top three companies in the US in 2014 would cause $18.8 billion in damages when burned. The report also includes data published for the first time detailing how mining companies have significantly underestimated the quantity of coal in some coal leases. For example, a coal lease that expanded a Peabody Energy mine in Colorado was estimated to contain 1.4 million tons of coal, but the company reported mining 2.5 million tons from that coal lease.